Sixty-three post-treatment stages 0–III borderline overweight and obese (body mass index ≥24 kg/m2) breast cancer survivors were randomly assigned to a 6-month, facility- and home-based viniyoga intervention (n = 32) or a waitlist control group (n = 31). The yoga goal was five practices per week. Primary outcome measures were changes in QOL, fatigue, and weight from baseline to 6 months. Secondary outcomes included changes in waist and hip circumference. 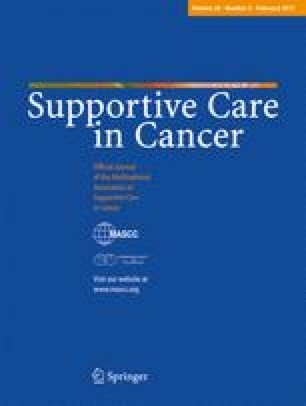 This study was presented in part at the TREC-FHCRC-NCI Conference on Energy Balance, Cancer Prognosis, and Survivorship in Seattle, WA in October 2009. The trial was registered at clinicaltrials.gov (identifier: NCT00476203). This material is based upon work supported in part by the Office of Research and Development Cooperative Studies Program, Department of Veterans Affairs and the Transdisciplinary Research in Energetics in Cancer (NCI 1U54 CA116847). The contents do not represent the views of the Department of Veterans Affairs or the US Government. We gratefully acknowledge the study participants; Laura Yon Brooks and Christy Fisher, for assistance designing the yoga protocol and teaching classes; Ann Enomoto, Lisa Yeager, and Linda Heuertz, for teaching classes.